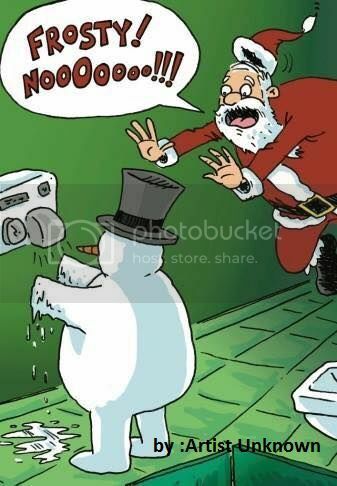 Santa Claus and Frosty wanted some fun. to take in a Disney Show. Santa called out the reindeer one by one. Candy, popcorn, and drinks they did partake. At intermission - need for bathroom break. where Frosty hands were now only a flake. Very funny poem, Eve. It got my mind's eye laughing w/the cool pic. Po' Frosty. Lol! Hilarious poem, my dear friend. Love and smiles and smiles of joy always. Back with congratulations Eve. Tom. oh no, is right!!! Great poem to go with that picture. BIG congrats, Eve. Haha..Congrats on your win Eve..
Ah, the picture posted with the limerick brings it into focus. Competition for this contest was awesome. Congratulations on your placement. Haha, find a refrigerator quickly, well written Eve. Good luck. Tom. Jan is the one that taught me, but I am not a funny person.. my husband and my sons are the ones with the humor.. It's a perfect limerick, when I started doing them my syllables were way out but folk on here put me right.